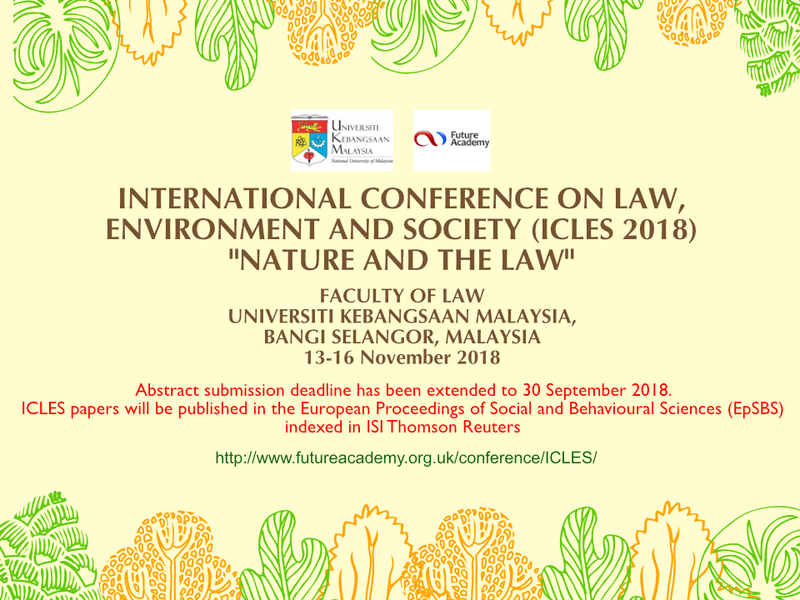 The TTT Regional Network is invited to participate in the 1st International Conference on Law, Environment and Society - Nature and the Law that will be held in the Faculty of Law, Universiti Kebangsaan Malaysia on 13 - 16 November 2018. A special keynote speech will be delivered by the Chief Justice of Malaysia, Yang Amat Arif Tan Sri Datuk Seri Panglima Richard Malanjum at 11:00 am, 14 November 2018. This conference offers a unique opportunity to researchers, academicians and students to present and share their research work through an online platform. This would further provide a venue to establish networks and linkages for future research collaboration with other participants at an international level. The 1st ICLES 2018 also serves as a catalyst to stimulate and innovate new ideas and solutions to environmental challenges for a greener future. All authors will publish their full text conference papers in European Proceedings of Social and Behavioural Sciences (EpSBS) e-ISSN: 2421-826X indexed in ISI Thomson Reuters. Selected papers may be published in the peer reviewed EJSBS, Jurnal Undang-undang dan Masyarakat (Journal of Law and Society) ISSN 1394 - 7729 or the Journal of Malaysian and Comparative Law ISSN 0126-6322. The 1st ICLES 2018 full text papers will appear online within 2 months after the Conference. Abstracts of all papers will be published in the Conference Book Abstract. The format for the virtual poster and power point presentation concept are provided in the rules of the Conference website. The official language of the Conference is English. This concept involves and electronic submission of these documents in a standard format. After the documents in the form of power point presentation are accepted, participants can access them via the conference website. For Virtual Poster Presentation, participants need not attend the Conference in person as your poster will be printed out and exhibited on your behalf in the local partner Institution’s Conference venue. For Poster Conference, participants must attend the Conference in person and your poster will be printed out and exhibited on your behalf in the local partner Institution’s Conference venue. All posters will be printed and presented in a hosting institution’s exhibition foyer from 14-16 November 2018. The exhibition will be open to all interested academicians, students, researchers and the public. Certificates of attendance and participation will be made available on the last day of the Conference. Note: If you are planning to attend the Conference in person, please ensure that you choose Poster Presentation Abstract Submission instead of the Virtual Presentation Abstract Submission. 11:00 - 12:00: Key note speech by Yang Amat Arif Tan Sri Datuk Seri Panglima Richard Malanjum, Chief Justice of Malaysia. 9:00 - 16:00: Continuation of in Person Participation Poster Exhibition. 9:00 - 13:00: Continuation of in Person Participation Poster Exhibition. * Future Academy and the local partner institution will not be providing any meals or conference materials. The language of the Peer reviewed Full Text Publication is English. We welcome your interest in the 1st ICLES 2018 and looking forward to receiving your abstract soon.